A technology firm in Dearborn is a harbinger of cutting-edge digital systems and services. When KLA Laboratories in Dearborn got its start in 1929, radios and record players were just coming of age, and public-address systems had yet to be refined. 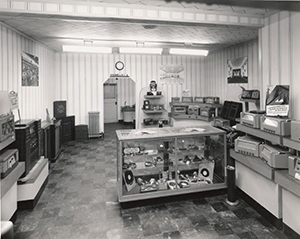 Through an early partnership with General Motors, the company began producing radio and electronic equipment. Founded by three partners, KLA’s early services included radio transmission, antenna reception, data collection, and time-keeping systems. In additon, KLA was instrumental in promoting the selling of war bonds during World War II through public address systems. Since its founding, the company has built up a notable client roster including the Big Three automakers, The Palace of Auburn Hills, Comerica Park, Ford Field, Joe Louis Arena, Michigan State University, the University of Michigan, and JP Morgan Chase, among others. Along the way, it has provided audio systems for every president since John F. Kennedy, and supported Pope John Paul II’s 1987 visit to Detroit — along with top sporting events. In addition, KLA equipment has been used in several movies filmed in Michigan, including the upcoming Batman v Superman: Dawn of Justice. Last July, KLA — which has 150 employees and a presence in 50 states, as well as Canada and Mexico — launched its Technical Monitoring Center, which provides network support, ticketing, and dispatch services.